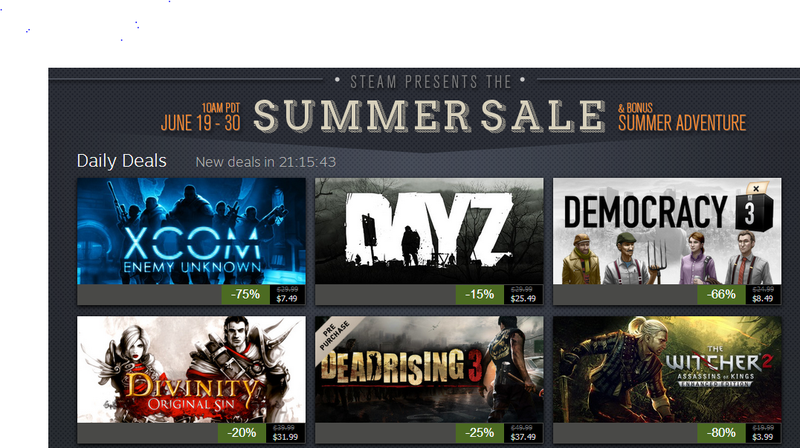 One of the most anticipated days of the summer is here: the Steam summer sale. PC gamers everywhere are examining their bank accounts and backlogs, wondering if they should drop some dollars on a enticing, cheap game. This means lots of people are talking about the Steam summer sale. What they're saying depends; there are a few major lines of thought. There are folks who know they're about to spend way too much. There are folks who don't really care about the event. There are folks who have found the ways in which Steam hiccups and falters thanks to the heavy load of traffic. There are those who get super excited about the whole thing, only to find there's not really much they want to buy. And there are folks who are taking this opportunity to express their love for Gabe Newell. Let's take a look at what people around the internet are saying about Steam sales, yes? Elitist PC gamers take this opportunity to do "GabeN's work"
What about you, what do you think about the summer sale? Have you bought anything? So far I've bought Kentucky Route Zero, The Novelist, Brothers, and Sir, You Are Being Hunted—despite being discounted a tad, none of these are on a daily sale. But since they're indie, I don't mind spending as much as I have. I'm going to wait on both Dark Souls II and CS:GO to see if they drop more in price, though. Otherwise...the sale doesn't seem as exciting as it used to, even if I've spent some money.